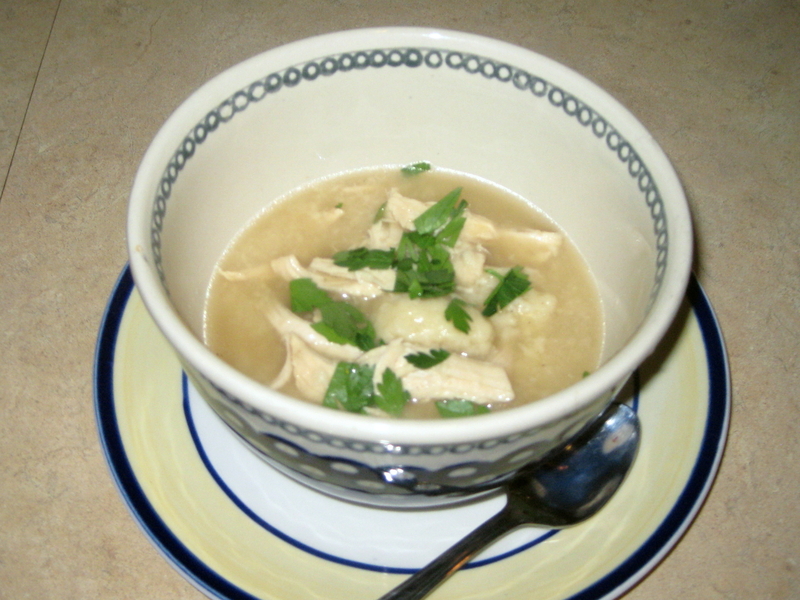 My grandmother, the beautiful and willful Rosalie Dial, made chicken and dumplings with her usual cooking-from-the-hip style. I laughed when I read her recipe that says, “Dump some boiling broth into a cup of flour and mix until stiff.” Not bad advice, after I’d tried it. Most recipes I’ve checked recommend boiling a whole hen to start things off. I have other things to do, rather than take a hen apart after it’s falling to pieces, so I’m taking an easier route. This concoction is ridiculously easy and Food Network Alton Brown’s way of dropping the dumplings is foolproof. That works for me. Enjoy! Header image via flickr user atxryan and used in accordance with a Creative Commons license. 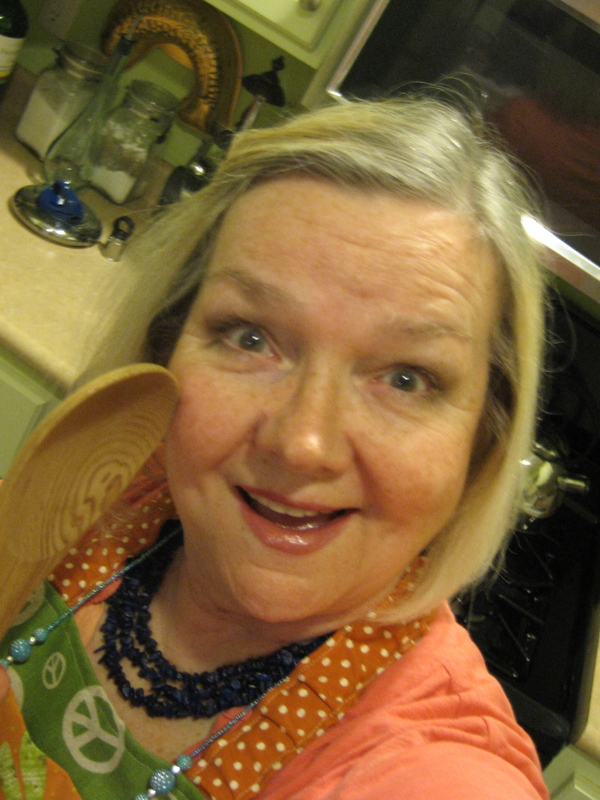 In your tall soup pot, put carrots, celery, lemon, bay leaf, a little salt and pepper, then pour in chicken broth. Bring to a boil. 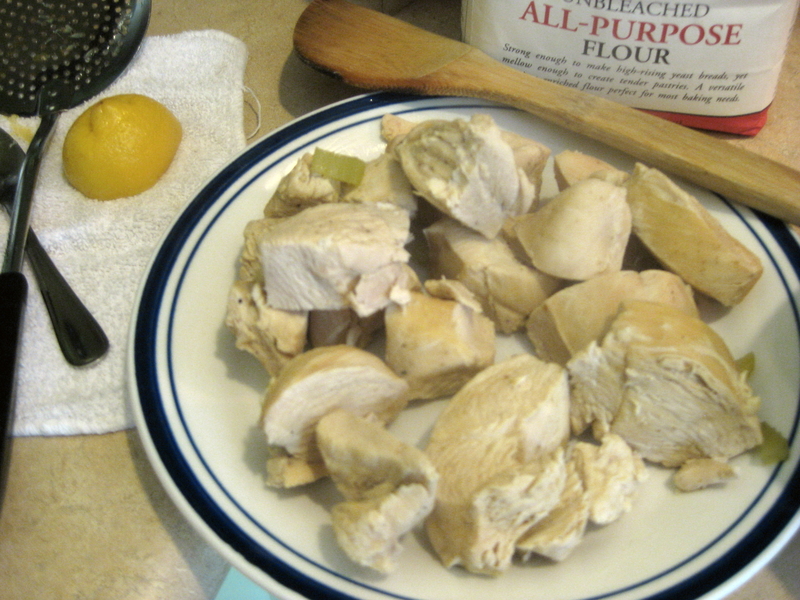 Rinse chicken breasts, then clean them up on a chopping board, using a knife to remove excess fat and cartilage. 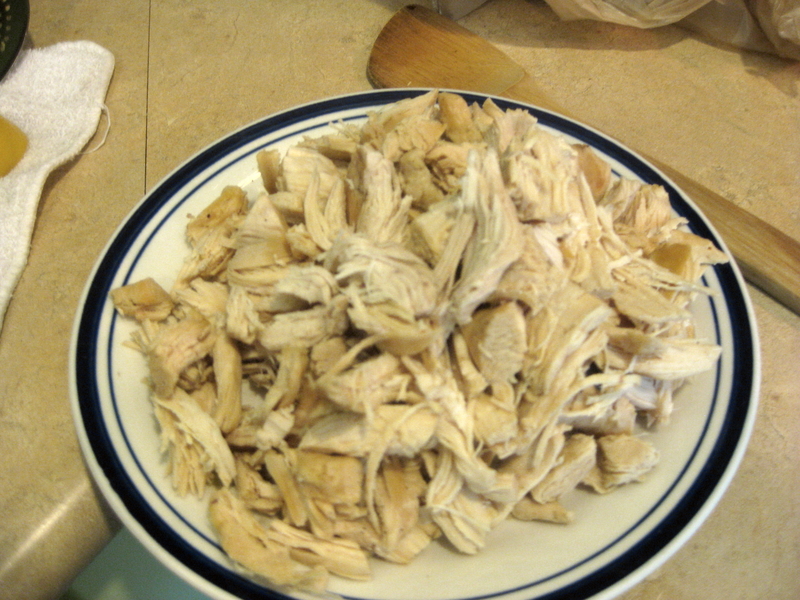 Cut each breast into 4-5 large chunks. 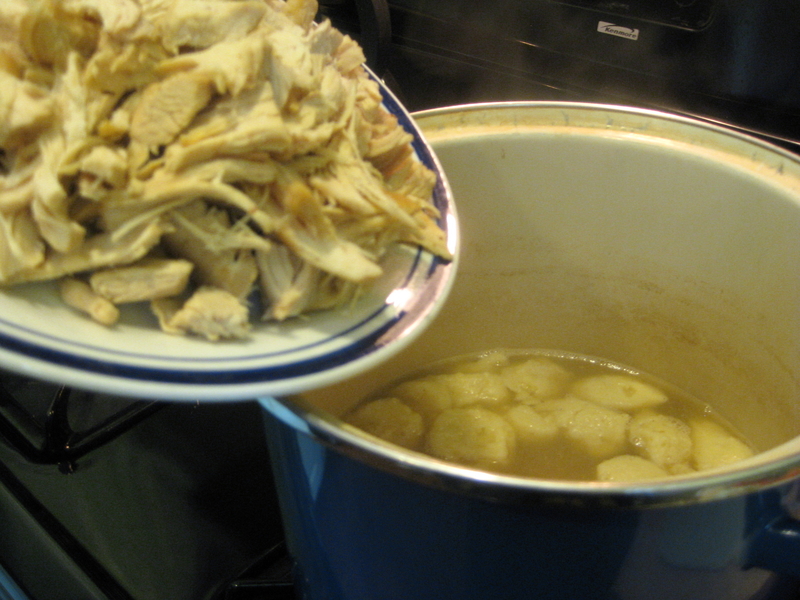 Carefully drop the chicken chunks into your boiling broth. 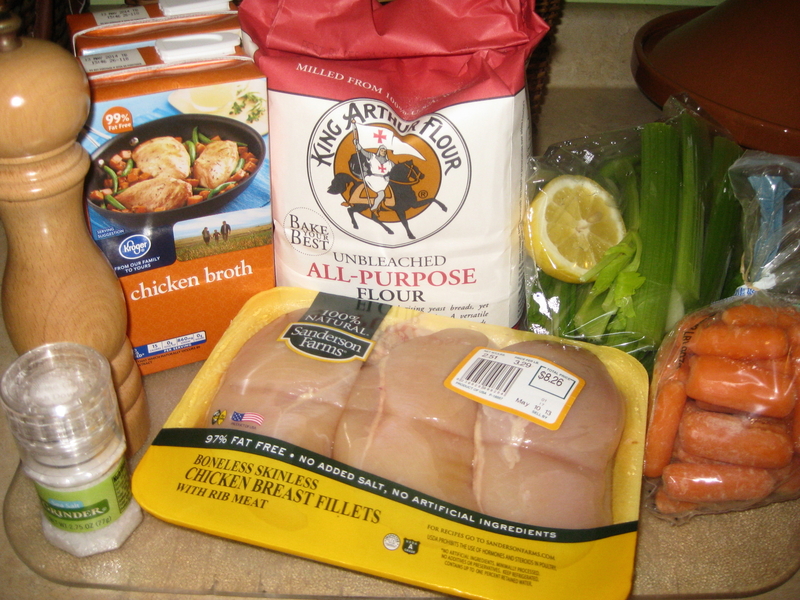 Cover, simmer about an hour until your chicken is falling apart or the chunk easily breaks. 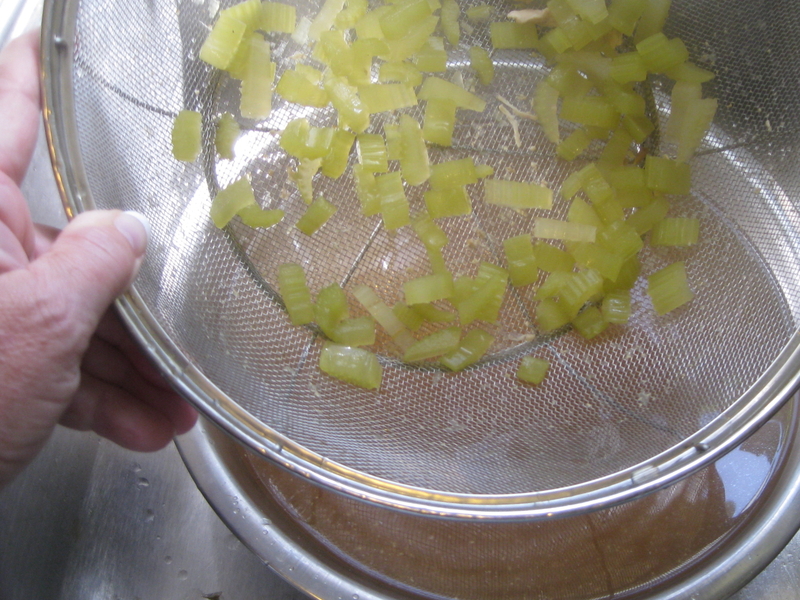 Remove your chunks to a plate, then strain broth to remove veggies, bay leaf, anything else floating around. (Your carrots will be delicious, so serve them on the side later.) Pour your strained broth back into the soup pot and taste for salt and pepper. Put 1 1/2 cups of broth, a teaspoon salt and the butter/margarine into the microwave for about 20 seconds or until butter/margarine melts. Pour flour into mixing bowl, and add broth. Stir to combine. Continue to add a little broth, if needed, until the mixture is “stiff,” which sort of means it maintains itself as a ball. 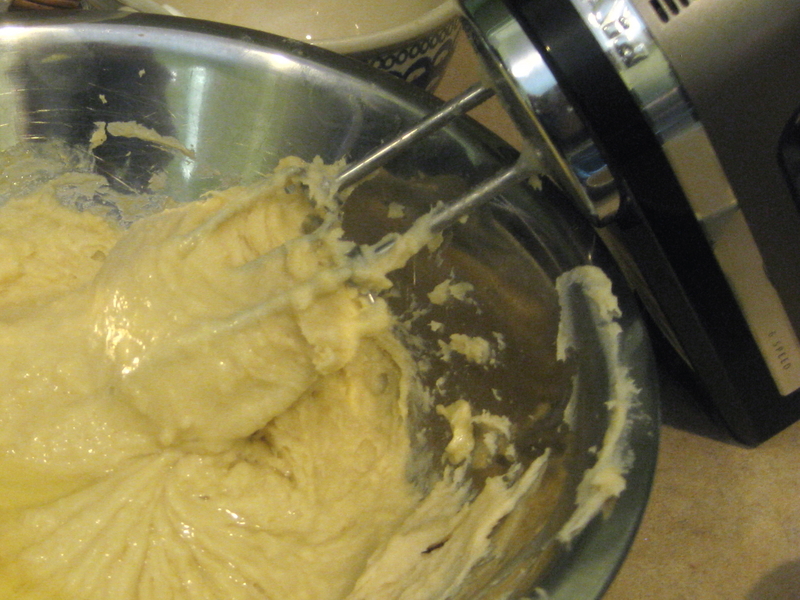 If your courage or wrist fails, pull out the hand mixer and stir on low until the mixture is smooth. This also helps cool it. 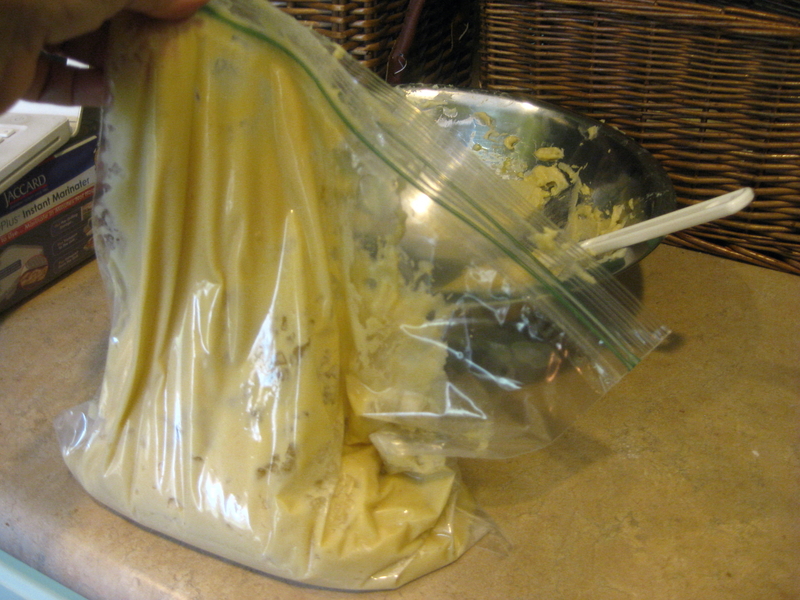 Transfer the dough to a 1-gallon resealable plastic bag. Squeeze the bag to move the dough into the lower half, twist the bag and attach a twist-tie to keep the dough down there. Cut off 1 corner of the bag to make a quarter-sized opening. 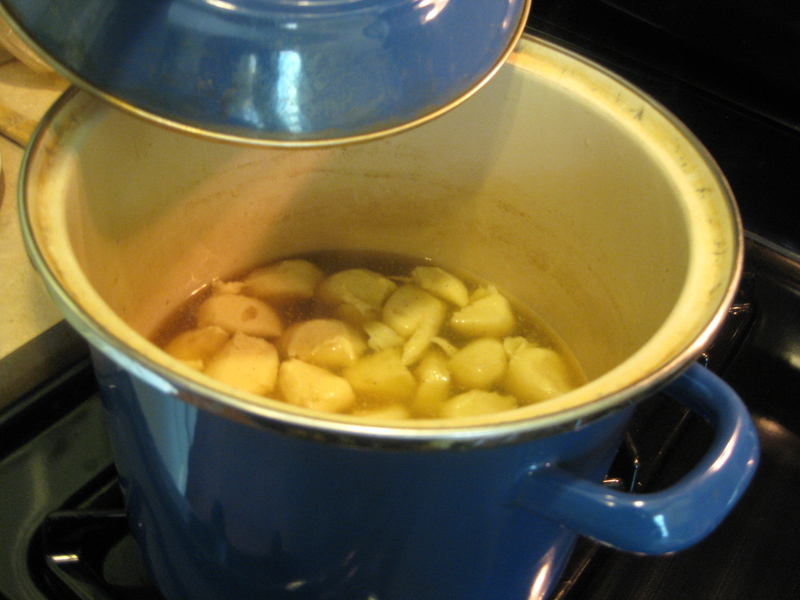 Add water to broth and bring to a slight simmer over medium heat. 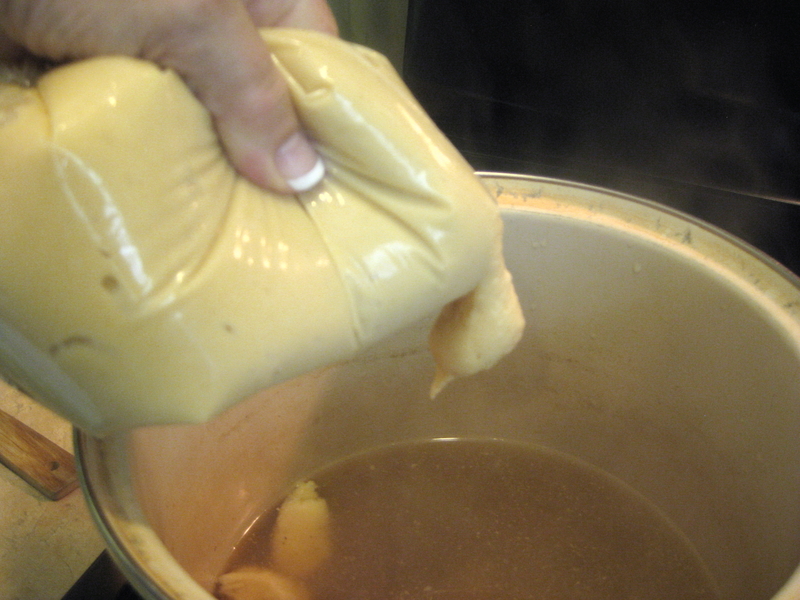 (Warning: Lower your dough-bag into the broth-pot so you lessen your chances of getting hit by splashing broth.) 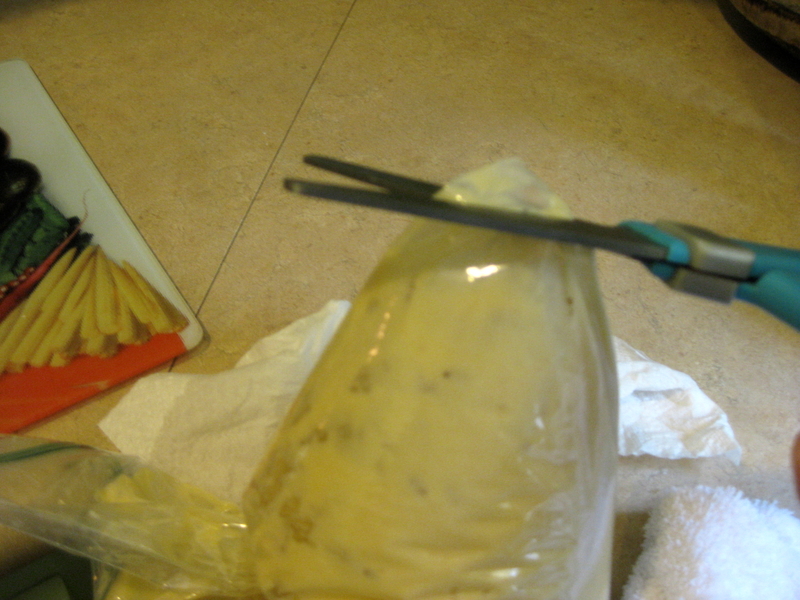 Squeeze your dough-bag (this is called “piping”) to release the dough out the hole and cut 1-inch pieces with kitchen shears directly over the broth. Repeat with the remaining batter. Cook, covered, until the dumplings are cooked through, about 8 to 10 minutes. While your dumplings cook, use your fingers and shred your chicken chunks. 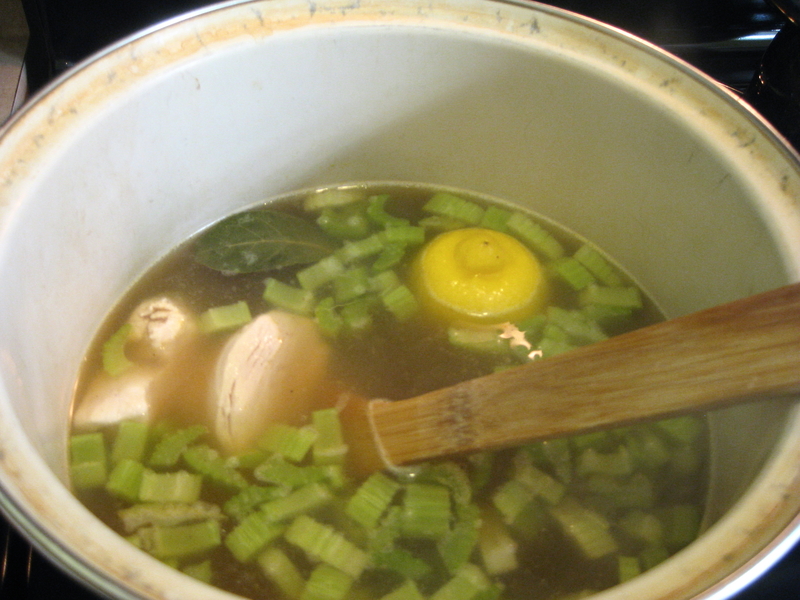 Turn off the broth heat, add the chicken and wait for 2 to 3 minutes before serving. Serve in bowls with freshly ground black pepper. For a pretty presentation, sprinkle just a pinch of freshly chopped parsley on the top. (Not too much or it can overpower the rest.) I’ve also seen some folks serve the mixture over rice, although I think straight-up works best. Don’t forget the carrots on the side. Be sure to serve with a soft roll or french bread to sop up the juice.